← How do you put yourself in another’s shoes? I received this today from Sandra Grieve, aka Red Thunder #72, Sioux Falls Roller Dollz. I have to share it. I imagine you receive many messages from skaters wanting to share their Roller Derby stories of triumph and tribulations; well friend here is another. I hope you take a few minutes because this story is real, and I anticipate you will walk away from it smiling. I hope. I tried out and made it through what I call the roughest six months of my life. I busted my tailbone right off the bat, was bruised in places I didn’t even know existed and was both physically and mentally exhausted with an infant at home and a husband that was trying his hardest to support me. Here I was not wanting to let a single day pass without skating and being around my new ‘sisters’. Our very first bout was held on March 31, 2006 here in Sioux Falls. We skated to a sold out crowd of 1900. When we were all gearing up we could here the crowd going crazy with anticipation. I remember feeling like I was either going to pass out, cry or puke. It was overwhelming. The time was finally here. I was about to skate in my first Roller Derby bout. I asked my dad to come to the house earlier that day because I needed a pep talk. We talked about the times we watched Roller Derby together and he kept telling me that day “I TOLD you! I knew you were going to do it!! It’s going to be an absolute riot!” Right before I left for the bout, he took off his jacket to show me the shirt he made. 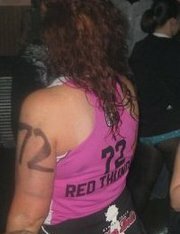 It was my team’s shirt which proudly had Red Thunder #72 on the back. After all, my registered derby name was Red Thunder. With my heart racing and the crowd chanting, I waited in line with my team as the announcers read our names off to skate out one at a time. And then it happened, I heard these words, middle blocker, #72, Red Thunderrrrrrr and I skated out. I was thankful it was dark enough in the Expo building so that no one would see me crying. I did it. I made it. And my dad was in the crowd wearing my shirt. I was living the dream! My dad came to almost every one of my bouts over the past four seasons and even to a few away games. Our team grew over the years and we finally made it to the Arena for our season four home closer. This was a huge step for us because this is where all of the other local sports teams play. That was held on May 10th 2010. My dad, still full of pride, came to the bout in the same shirt he wore every time. The one he made with my name and number on it. Jerry, it was the last time I would see my dad. He was killed in a motorcycle accident less than two weeks later. Throughout my grieving process I contemplated retiring from Roller Derby. Even though I skated for me, he was always such a part of it, how could I go on? I can tell you why, that’s easy. When I am on that track, my dad is right there with me, always. Plus I have a wonderful husband who sports my team shirt with Mr. Red Thunder on the back of it and a six-year-old son who thinks his mom is a superhero. My gratitude to your dad and his passion and to you for keeping it alive. Thank you.